Aleks and the Ramps are an experimental pop quintet from Melbourne, Australia. This October, Japanese audiences will again be able to meet Aleks and the Ramps on stage, this time with all five members in tow. Since forming in 2005, the band have released two albums - Pisces vs Aquarius, and Midnight Believer. They've delighted and confused crowds Australia-wide, touring the country numerous times, and venturing as far as Canada and New Zealand. They also played some low-key shows in Tokyo as a 2-piece in 2008, and since then they've spent their time playing alongside esteemed acts such as The Sea and Cake, Dan Deacon, Why?, The Ruby Suns and Vivian Girls. In 2009, the group released Midnight Believer - a critically lauded 40 minute album of strange, abstract and addictive pop tunes. The album's first single 'Antique Limb' was played on the radio extensively, and its video clip was seen on TVs in Australia and YouTube far beyond. Their mothers were proud. Live on stage, Aleks and the Ramps are a surreal treat: bursts of noise scattered between pop gems, a group cacophony of the most joyful nature, with dynamic songs that flaunt the potential of pop and melody. Lights are attached to things they aren't usually attached to. Shirts are lost. Kittens are worshipped through dance. Drums, synths and guitars form inappropriate relationships. ii. Aleks and the Ramps members, Alex Nosek and Jon Tjhia, will also be playing in ii, their abstract, experimental pop project. 4 bonjour's parties, the lovely seven-piece indie-pop band will also be playing some shows with Aleks and the Ramps. 10/18 - Shibuya O-Nest Aleks and the Ramps, The Velvet Teen, The New Trust. Details. 10/22 - Shimokitazawa Basement Bar/Three. BASEMENT BAR - Aleks and the Ramps, 4 bonjour's parties, oono yuuki, SoulTuneFactory. THREE - ii, FilFla, たゆたう, kooreruongaku. Details. 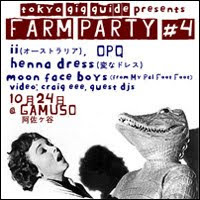 10/24 - Asagaya Gamuso - ii, OPQ, henna dress, Moon Face Boys. Details.